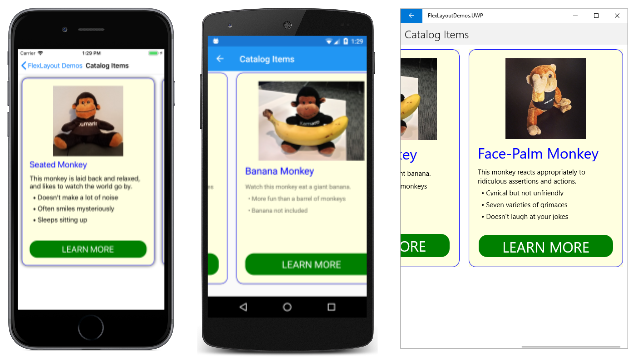 Use FlexLayout for stacking or wrapping a collection of child views. 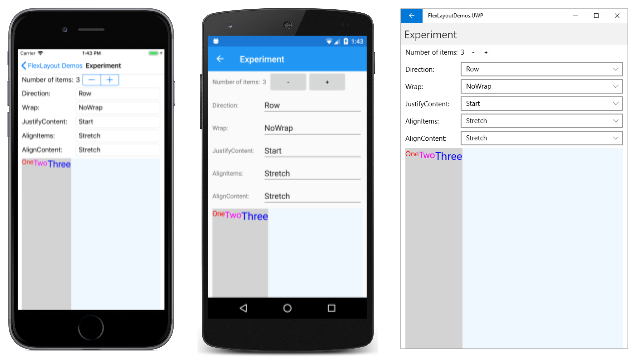 The Xamarin.Forms FlexLayout is new in Xamarin.Forms version 3.0. It is based on the CSS Flexible Box Layout Module, commonly known as flex layout or flex-box, so called because it includes many flexible options to arrange children within the layout. 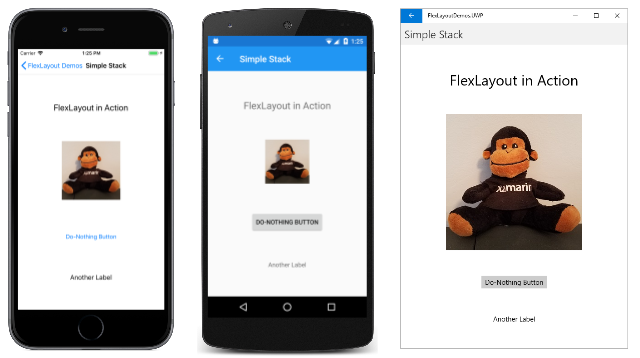 FlexLayout is similar to the Xamarin.Forms StackLayout in that it can arrange its children horizontally and vertically in a stack. However, the FlexLayout is also capable of wrapping its children if there are too many to fit in a single row or column, and also has many options for orientation, alignment, and adapting to various screen sizes. 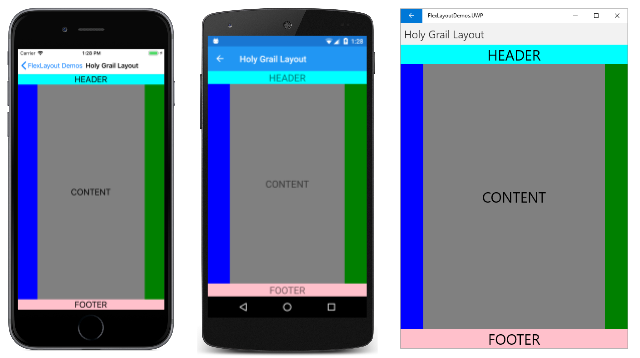 FlexLayout derives from Layout<View> and inherits a Children property of type IList<View>. FlexLayout defines six public bindable properties and five attached bindable properties that affect the size, orientation, and alignment of its child elements. (If you're not familiar with attached bindable properties, see the article Attached properties.) These properties are described in detail in the sections below on The bindable properties in detail and The attached bindable properties in detail. However, this article begins with a section on some Common usage scenarios of FlexLayout that describes many of these properties more informally. Towards the end of the article, you'll see how to combine FlexLayout with CSS style sheets. 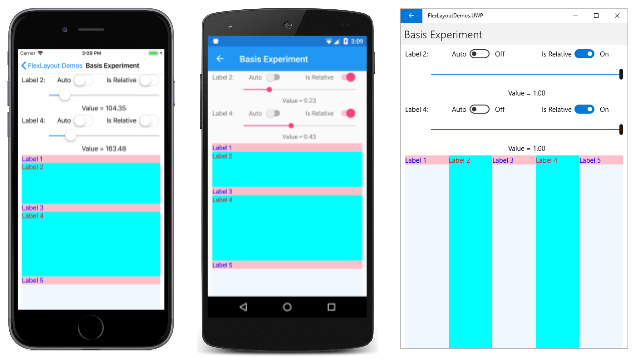 The FlexLayoutDemos sample program contains several pages that demonstrate some common uses of FlexLayout and allows you to experiment with its properties. The Direction property is set to a value of the FlexDirection enumeration. The default is Row. Setting the property to Column causes the children of the FlexLayout to be arranged in a single column of items. When items in a FlexLayout are arranged in a column, the FlexLayout is said to have a vertical main axis and a horizontal cross axis. The AlignItems property is of type FlexAlignItems and specifies how items are aligned on the cross axis. The Center option causes each item to be horizontally centered. With that change, this one Label is positioned at the left edge of the FlexLayout when the reading order is left-to-right. The JustifyContent property is of type FlexJustify, and specifies how items are arranged on the main axis. The SpaceEvenly option allocates all leftover vertical space equally between all the items, and above the first item, and below the last item. If you were using a StackLayout, you would need to assign the VerticalOptions property of each item to CenterAndExpand to achieve a similar effect. But the CenterAndExpand option would allocate twice as much space between each item than before the first item and after the last item. You can mimic the CenterAndExpand option of VerticalOptions by setting the JustifyContent property of FlexLayout to SpaceAround. These FlexLayout properties are discussed in more detail in the section The bindable properties in detail below. The Direction property of this FlexLayout is not set, so it has the default setting of Row, meaning that the children are arranged in rows and the main axis is horizontal. The Wrap property is of an enumeration type FlexWrap. If there are too many items to fit on a row, then this property setting causes the items to wrap to the next row. Notice that the FlexLayout is a child of a ScrollView. If there are too many rows to fit on the page, then the ScrollView has a default Orientation property of Vertical and allows vertical scrolling. The JustifyContent property allocates leftover space on the main axis (the horizontal axis) so that each item is surrounded by the same amount of blank space. Text = "Cannot access list of bitmap files"
There is a standard layout in web design called the holy grail because it's a layout format that is very desirable, but often hard to realize with perfection. The layout consists of a header at the top of the page and a footer at the bottom, both extending to the full width of the page. Occupying the center of the page is the main content, but often with a columnar menu to the left of the content and supplementary information (sometimes called an aside area) at the right. Section 5.4.1 of the CSS Flexible Box Layout specification describes how the holy grail layout can be realized with a flex box. The navigation and aside areas are rendered with a BoxView on the left and right. 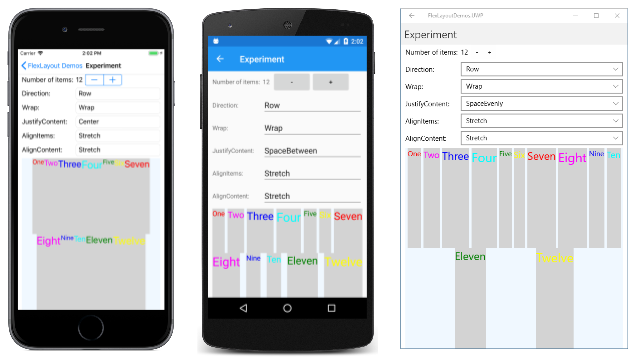 The first FlexLayout in the XAML file has a vertical main axis and contains three children arranged in a column. These are the header, the body of the page, and the footer. 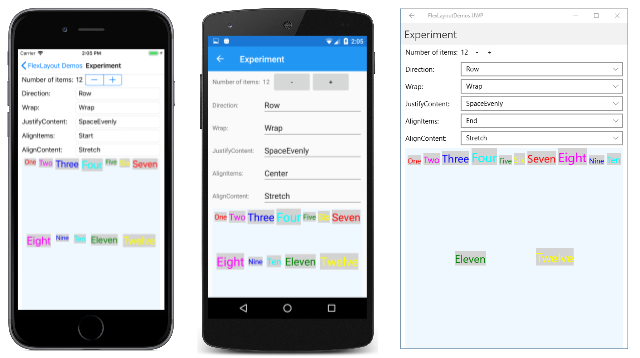 The nested FlexLayout has a horizontal main axis with three children arranged in a row. The Order attached bindable property is set on the first BoxView. This property is an integer with a default value of 0. You can use this property to change the layout order. Generally developers prefer the content of the page to appear in markup prior to the navigation items and aside items. Setting the Order property on the first BoxView to a value less than its other siblings causes it to appear as the first item in the row. Similarly, you can ensure that an item appears last by setting the Order property to a value greater than its siblings. The Basis attached bindable property is set on the two BoxView items to give them a width of 50 pixels. This property is of type FlexBasis, a structure that defines a static property of type FlexBasis named Auto, which is the default. You can use Basis to specify a pixel size or a percentage that indicates how much space the item occupies on the main axis. It is called a basis because it specifies an item size that is the basis of all subsequent layout. The Grow property is set on the nested Layout and on the Label child representing the content. This property is of type float and has a default value of 0. When set to a positive value, all the remaining space along the main axis is allocated to that item and to siblings with positive values of Grow. The space is allocated proportionally to the values, somewhat like the star specification in a Grid. The first Grow attached property is set on the nested FlexLayout, indicating that this FlexLayout is to occupy all the unused vertical space within the outer FlexLayout. The second Grow attached property is set on the Label representing the content, indicating that this content is to occupy all the unused horizontal space within the inner FlexLayout. There is also a similar Shrink attached bindable property that you can use when the size of children exceeds the size of the FlexLayout but wrapping is not desired. The Order setting of –1 causes the Image element to be displayed first in each of the nested FlexLayout views regardless of its position within the children collection. The AlignSelf property of Center causes the Image to be centered within the FlexLayout. This overrides the setting of the AlignItems property, which has a default value of Stretch, meaning that the Label and Button children are stretched to the full width of the FlexLayout. Within each of the three FlexLayout views, a blank Label precedes the Button, but it has a Grow setting of 1. This means that all the extra vertical space is allocated to this blank Label, which effectively pushes the Button to the bottom. 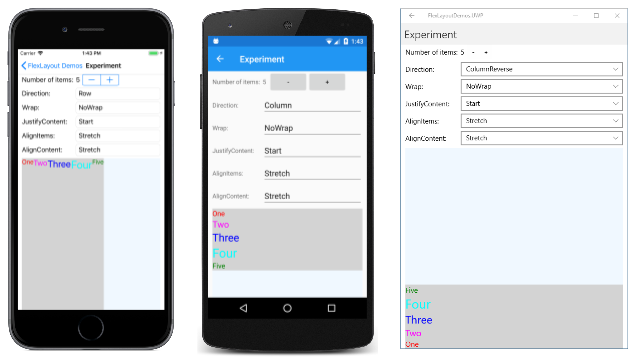 You can experiment with the five remaining bindable properties using the Experiment page of the FlexLayoutDemos sample. This page allows you to add or remove children from a FlexLayout and to set combinations of the five bindable properties. All the children of the FlexLayout are Label views of various colors and sizes, with the Text property set to a number corresponding to its position in the Children collection. Each of the Label views has a gray background that shows the space allocated to that Label within the FlexLayout. The background of the FlexLayout itself is Alice Blue. It occupies the entire bottom area of the page except for a little margin at the left and right. Notice that for the Reverse options, the items start at the right or bottom. When the Wrap property is set to NoWrap and the main axis is constrained (as in this program), and the main axis is not wide or tall enough to fit all the children, the FlexLayout attempts to make the items smaller, as the iOS screenshot demonstrates. You can control the shrinkness of the items with the Shrink attached bindable property. 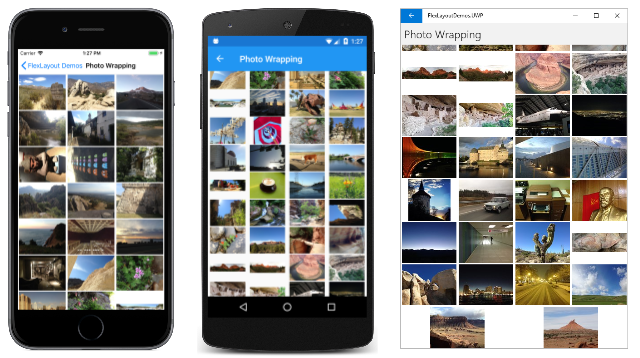 In all three screenshots, the Wrap property is set to Wrap. The Start default is shown in the previous Android screenshot. The iOS screenshot here shows the Center option: all the items are moved to the center. The three other options beginning with the word Space allocate the extra space not occupied by the items. 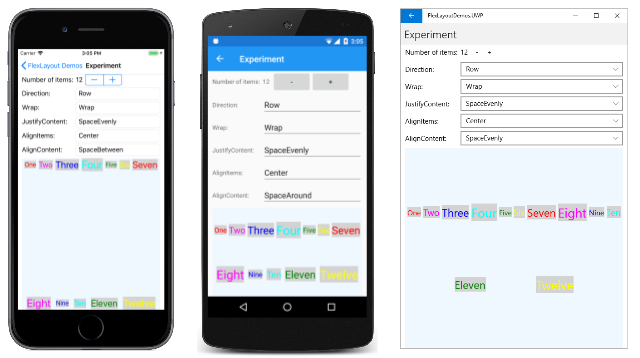 SpaceBetween allocates the space equally between the items; SpaceAround puts equal space around each item, while SpaceEvenly puts equal space between each item, and before the first item and after the last item on the row. In the iOS screenshot, the tops of all the children are aligned. In the Android screenshots, the items are vertically centered based on the tallest child. In the UWP screenshot, the bottoms of all the items are aligned. For any individual item, the AlignItems setting can be overridden with the AlignSelf attached bindable property. The AlignContent has no effect when there is only one row or column. FlexLayout defines five attached bindable properties. These properties are set on children of the FlexLayout and pertain only to that particular child. For any individual child of the FlexLayout, this property setting overrides the AlignItems property set on the FlexLayout itself. The default setting of Auto means to use the AlignItems setting. The Order property is of type int. The default value is 0. The Order property allows you to change the order that the children of the FlexLayout are arranged. Usually, the children of a FlexLayout are arranged is the same order that they appear in the Children collection. You can override this order by setting the Order attached bindable property to a non-zero integer value on one or more children. The FlexLayout then arranges its children based on the setting of the Order property on each child, but children with the same Order setting are arranged in the order that they appear in the Children collection. The Basis attached bindable property indicates the amount of space that is allocated to a child of the FlexLayout on the main axis. The size specified by the Basis property is the size along the main axis of the parent FlexLayout. Therefore, Basis indicates the width of a child when the children are arranged in rows, or the height when the children are arranged in columns. The Basis property is of type FlexBasis, a structure. The size can be specified in either device-independent units or as a percentage of the size of the FlexLayout. The default value of the Basis property is the static property FlexBasis.Auto, which means that the child's requested width or height is used. This fractional value must be in the range of 0 to 1. 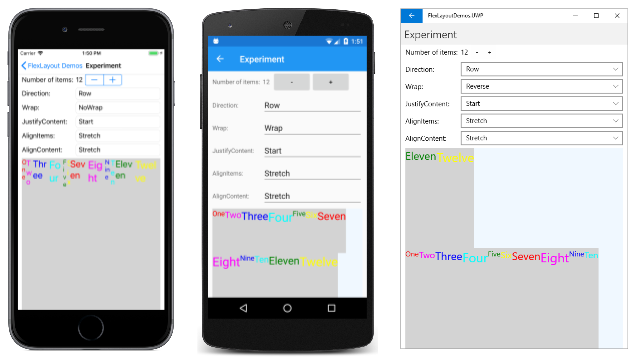 The iOS screenshot at the left shows the two Label elements being given heights in device-independent units. The Android screen shows them being given heights that are a fraction of the total height of the FlexLayout. If the Basis is set at 100%, then the child is the height of the FlexLayout, and will wrap to the next column and occupy the entire height of that column, as the UWP screenshot demonstrates: It appears as if the five children are arranged in a row, but they're actually arranged in five columns. The Grow attached bindable property is of type int. The default value is 0, and the value must be greater than or equal to 0. The Grow property plays a role when the Wrap property is set to NoWrap and the row of children has a total width less than the width of the FlexLayout, or the column of children has a shorter height than the FlexLayout. The Grow property indicates how to apportion the leftover space among the children. If any one child is given a positive Grow value, then that child takes up all the remaining space, as the Android screenshot demonstrates. This space can also be allocated among two or more children. 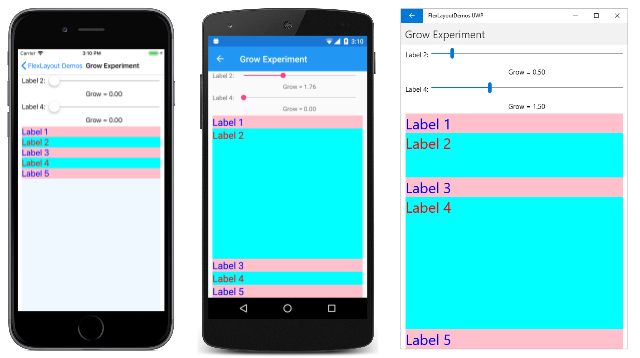 In the UWP screenshot, the Grow property of the second Label is set to 0.5, while the Grow property of the fourth Label is 1.5, which gives the fourth Label three times as much of the leftover space as the second Label. How the child view uses that space depends on the particular type of child. For a Label, the text can be positioned within the total space of the Label using the properties HorizontalTextAlignment and VerticalTextAlignment. The Shrink attached bindable property is of type int. The default value is 1, and the value must be greater than or equal to 0. The Shrink property plays a role when the Wrap property is set to NoWrap and the aggregate width of a row of children is greater than the width of the FlexLayout, or the aggregate height of a single column of children is greater than the height of the FlexLayout. Normally the FlexLayout will display these children by constricting their sizes. The Shrink property can indicate which children are given priority in being displayed at their full sizes. 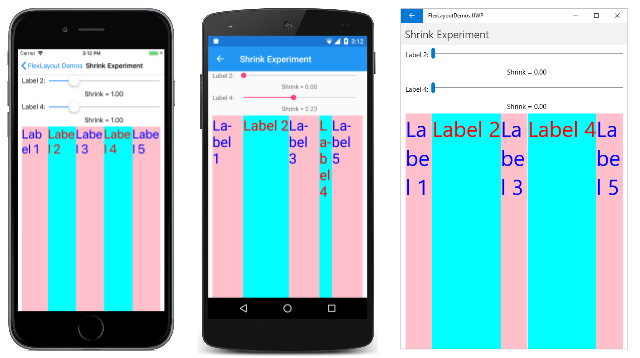 In the Android screenshot, the Shrink value for the second Label is set to 0, and that Label is displayed in its full width. Also, the fourth Label is given a Shrink value greater than one, and it has shrunk. The UWP screenshot shows both Label elements being given a Shrink value of 0 to allow them to be displayed in their full size, if that is possible. You can set both the Grow and Shrink values to accommodate situations where the aggregate child sizes might sometimes be less than or sometimes greater than the size of the FlexLayout. Several FlexLayout attached bindable properties are referenced here. In the label.empty selector, you'll see the flex-grow attribute, which styles an empty Label to provide some blank space above the Button. The image selector contains an order attribute and an align-self attribute, both of which correspond to FlexLayout attached bindable properties. You've seen that you can set properties directly on the FlexLayout and you can set attached bindable properties on the children of a FlexLayout. 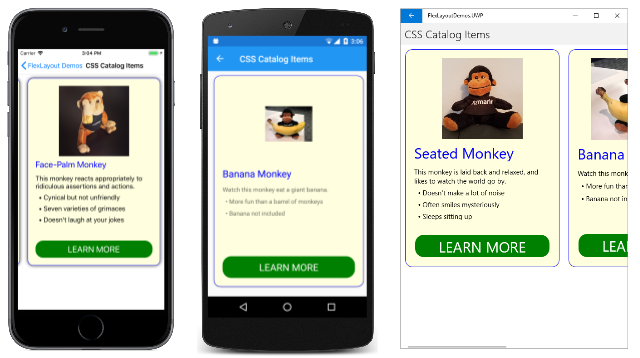 Or, you can set these properties indirectly using traditional XAML-based styles or CSS styles. What's important is to know and understand these properties. These properties are what makes the FlexLayout truly flexible.